There is no bamboo at Bamboo Ridge. The rocky fishing spot is so called because of the bamboo poles that used to be lined up there by fishermen. Darrell Lum (left) and Eric Chock revisit the O'ahu site that lent the press its name. More than 850 writers, poets and visual artists have found a home in the pages of an award-winning local literary journal called Bamboo Ridge. They represent a literary cross-section of local culture—people with diverse backgrounds, interests and perspectives who share a sense of place grounded in Hawaiʻi, writers published through a non-profit labor of love reliant on a small army of highly dedicated volunteers. 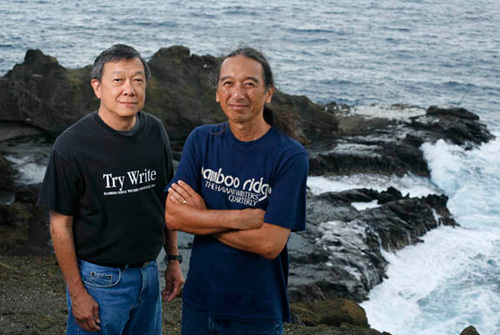 Founded in 1978 by editors Darrell Lum (BA ’72, MEd ’76, EdD ’97 Mānoa) and Eric Chock (MA ’77 Mānoa), Bamboo Ridge, Journal of Hawaiʻi Literature and Arts has from its inception existed in a sort of symbiosis with the University of Hawaiʻi. In the late ’70s the university was in the curious position of primarily teaching traditional “dead white guys” of the literary canon (to the exclusion of minorities and women) while at the same time training local creative writers to write authentically, to write what they know, to write about Hawaiʻi. “That was a hard lesson for me to learn,” Lum says, reflecting on his first “awful” attempts at short stories, modeled on things he’d read but never experienced. Long-time English department instructor Phil Damon (now retired) told Lum to write about the people, places and things that he knew, and Lum took it to heart. Around the same time, Lum’s childhood friend and poet Chock was finishing his master’s degree in creative writing. “And get them to subscribe,” adds Chock. The Talk Story Ethnic American Writers Conference—a seminal, grass-roots gathering organized by UH Mānoa Department of English lecturers Marie Hara (BA ’65, MA ’70 Mānoa), Arnold Hiura (BA ’73 Mānoa) and Stephen Sumida—was a key turning point in the local literature movement, or as Hara puts it, a seed from which many shoots have grown. Building on the theme Our Voices in Literature and Song, the conference pulled about 150 literary types—poets, authors, editors, journalists—together with Hawaiian and pidgin language professionals, scholars from other disciplines, playwrights and directors, songwriters and performers. Panels convened around ethnicity, language, theater, Hawaiian chant, oral history and education—all conversations that continue today in myriad ways. Another enduring aspect is live performance, including readings, screenings, musical performances and plays. Among the participants was a large contingent of Asian American writers, mostly from the west coast of the United States. “It was sort of an awakening for us, we were similar but different,” says Lum. Local writers embraced pidgin in spite of the disapproval of many traditional educators. The conference proceedings anthologized the works of many participating writers. Hiura and Sumida produced a bibliography of literature not typically considered when discussing Hawaiʻi writing, including early work in pidgin, plantation stories and the like. Following the trail they blazed, a whole cadre of writers use pidgin in their writing today. Many of these writers have UH ties as alumni, educators or both. The most well-known and successful Bamboo Ridge writers are probably Lois Ann Yamanaka (BEd ’83 Mānoa) and Nora Okja Keller, nationally published authors several times over. Keller taught for many years at Mānoa; former public school teacher Yamanaka now runs a private writing school called Naʻau. Other UH educators who have been published by Bamboo Ridge include Mavis Hara and Lisa Linn Kanae at Kapiʻolani Community College, Juliet Kono Lee at Leeward Community College, Brenda Kwon at Honolulu Community College and Marie Hara, Ian MacMillan and Rodney Morales at UH Mānoa, to name but a few. One of the best-selling Bamboo Ridge issues is Growing up Local. The anthology of established, emerging and student writers was put together with Mānoa’s Curriculum Research and Development Group. The guide’s original materials and questions generate discussion and personal writing, he says, and students respond very positively. The reaction of Tonouchi’s community college students to reading Bamboo Ridge materials is mixed. “Get some local students who get all thrilled for see demselfs represent in literature (like how I wuz back when I wuz one student). But den, get some local students who wondah how come we learning dis for and not studying ʻreal’ literature. Bamboo Ridge may have started as a reaction against what was being taught and what wasn’t being published, but these days, Bamboo Ridge publications are listed on course syllabi, discussed in dissertations and used as high school and college textbooks. Woman- and minority-focused literature classes are de rigueur across the university system and Bamboo Ridge is featured weekly on the Hawaiʻi Public Radio production Aloha Shorts. What Bamboo Ridge may not have earned in monetary rewards, it’s certainly earned in influence and longevity. The press closes its 2008 yearlong celebration of 30 years of publishing with a huge birthday bash on the launch date of their first issue, Dec. 6, at the Hale Koa Hotel. Call 808 626-1481 for information. Where are they now: Still editors, Lum retired after 33 years in student support services at UH Mānoa and Chock teaches English at UH West Oʻahu. Hiura has been very active in the local book and newspaper publishing community. Sumida is a professor of American ethnic studies at the University of Washington; one of his courses is Hawaiʻi’s literatures. Hara, who fought for and taught the first Asian American literature classes at Mānoa, is back in the department nurturing a new generation of writers. Fishing and school, what more could you ask for in life, I know I still miss my days at the University. I am a former student of Darrel Lum’s from when he taught at Chaminade (late 1970′s). The Bamboo Ridge display of his work inspires the comment-offering (from Beachcomber). “You would think he was talking to the waves or the fishes.” Said the beachcomber. The bird chirped as though it knew he wanted to have fish for lunch. In one case, the beachcomber did have fish. It was dried fish. Papio. For some of the birds, there would be Papio bones to pick. And the beachcomber heard. “That’s a public domain song, isn’t it?” The beachcomber commented.